Patio Enclosures, Inc. (“Patio”) is a leading manufacturer, retailer, and distributor of sunrooms, solariums, patios, and porch enclosures. Products are sold primarily to residential markets through company-operated stores, franchise, and dealer networks. MelCap Partners acted as the sell side advisor to Patio. 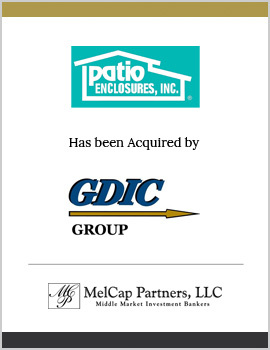 Patio was successfully sold to GDIC Group, LLC, a private equity group located in Cleveland, Ohio.